Have you applied for Indian Coast Guard's Assistant Commandant 01/2014 batch and looking for Final Selection Board (FSB) interview dates? Indian Coast Guard has released four lists of SSB interviews. Check out final selection board interview dates. Indian Coast Guard is one of the best careers to opt as it gives plenty of opportunity for young and talented Indian citizens. Applications were invited from graduates through notification of Assistant Commandant 01/2014 batch of Indian Coast Guard. After receiving the applications, based on the marks of academic exam, shortlisted candidates received call letters for preliminary interview. 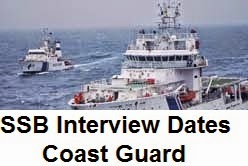 Based on the preliminary interview, Indian Coast Guard has published four lists of Final Selection Board interview dates for selecting candidates for its Assistant Commandant 01/2014 batch. Ist list of candidates will have to attend SSB interview from 22 July 2013 to 26 July 2013. There are total 50 candidates in the first list of FSB interview call letter first batch. All candidates need to report at 0800 hrs. Check out FSB list of 1st batch of Assistant Commandant 01/2014 batch interviews. Second list consists of total 80 candidates and will have to undergo SSB interviews from 29 July 2013 to 2 August 2013. Reporting time is 0800 hrs. All have to report to Coast Guard Selection Board Noida. Check out FSB list of 2nd batch of Assistant Commandant 01/2014 batch interviews. Third interview list of Assistant Commandant 01/2014 batch consists of total 70 candidates. Interview will commence on 04 August and will continue till 8 August 2013. All candidates need to report at 1400 hrs. Check out FSB list of 3rd batch of Assistant Commandant 01/2014 batch interviews. Fourth interview consist of 40 candidates. Reporting time is 1400 hrs for the 4th batch. Interviews will be held from 11th to 14th August 2013. Check out FSB list of 4th batch of Assistant Commandant 01/2014 batch interviews.